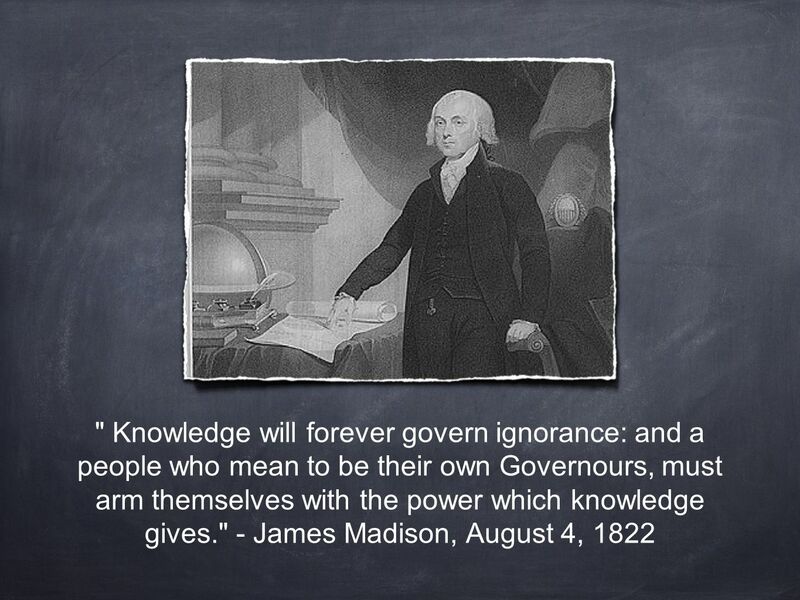 " Knowledge will forever govern ignorance: and a people who mean to be their own Governours, must arm themselves with the power which knowledge gives." 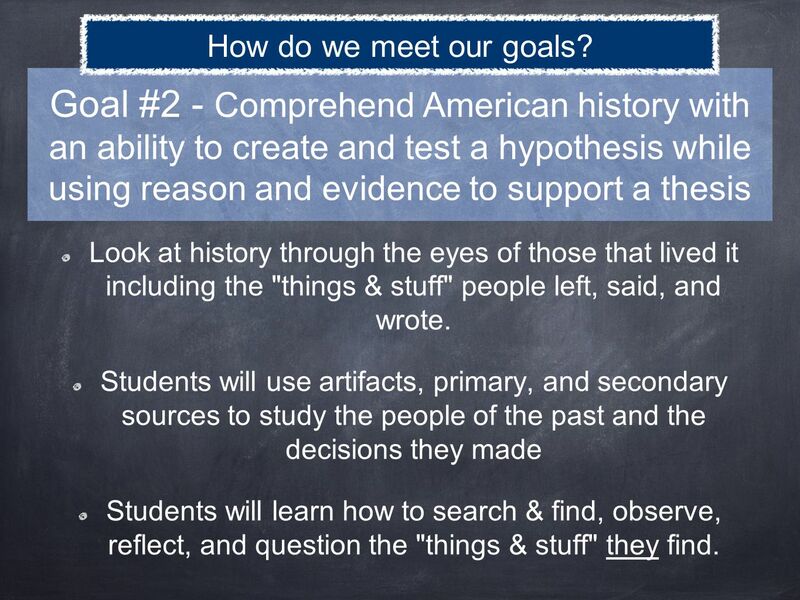 5 Goal #2 - Comprehend American history with an ability to create and test a hypothesis while using reason and evidence to support a thesis Look at history through the eyes of those that lived it including the "things & stuff" people left, said, and wrote. 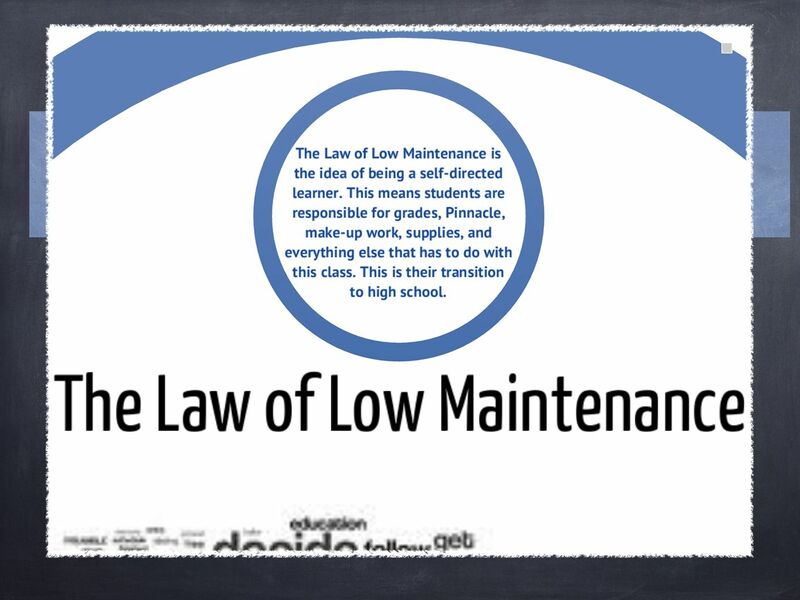 Students will use artifacts, primary, and secondary sources to study the people of the past and the decisions they made Students will learn how to search & find, observe, reflect, and question the "things & stuff" they find. How do we meet our goals? 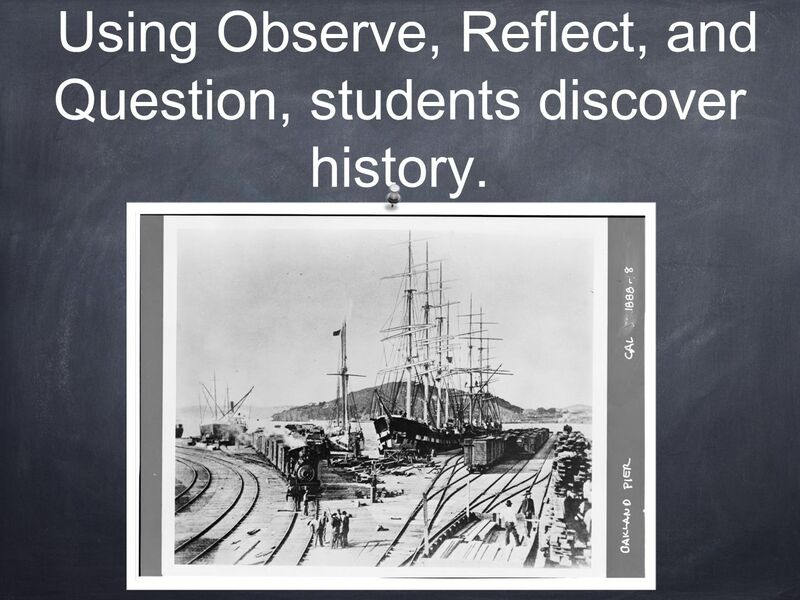 6 Using Observe, Reflect, and Question, students discover history. 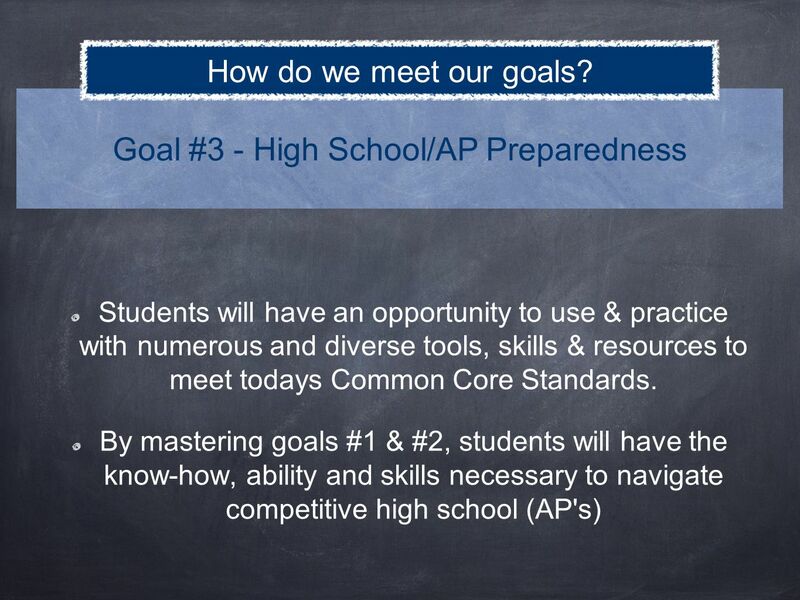 7 Goal #3 - High School/AP Preparedness Students will have an opportunity to use & practice with numerous and diverse tools, skills, & resources to meet todays Common Core Standards. How do we meet our goals? 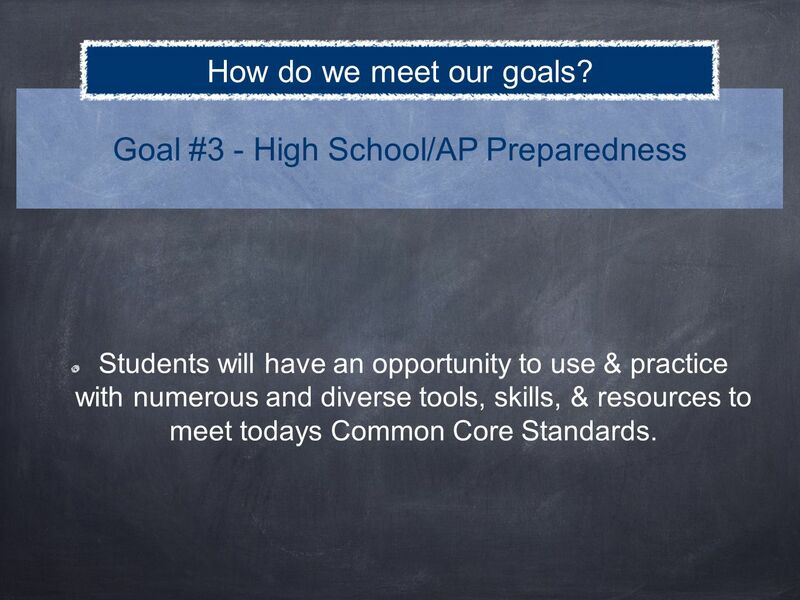 9 Goal #3 - High School/AP Preparedness Students will have an opportunity to use & practice with numerous and diverse tools, skills & resources to meet todays Common Core Standards. 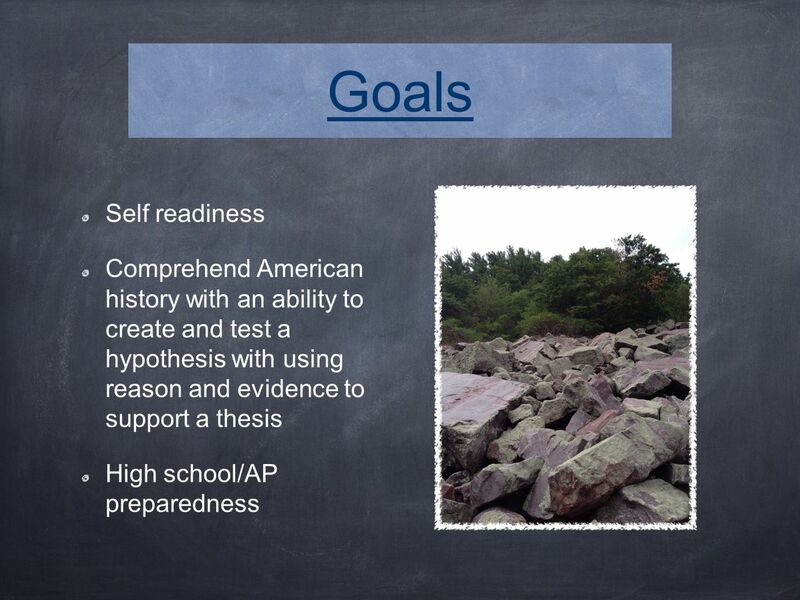 By mastering goals #1 & #2, students will have the know-how, ability and skills necessary to navigate competitive high school (AP's) How do we meet our goals? 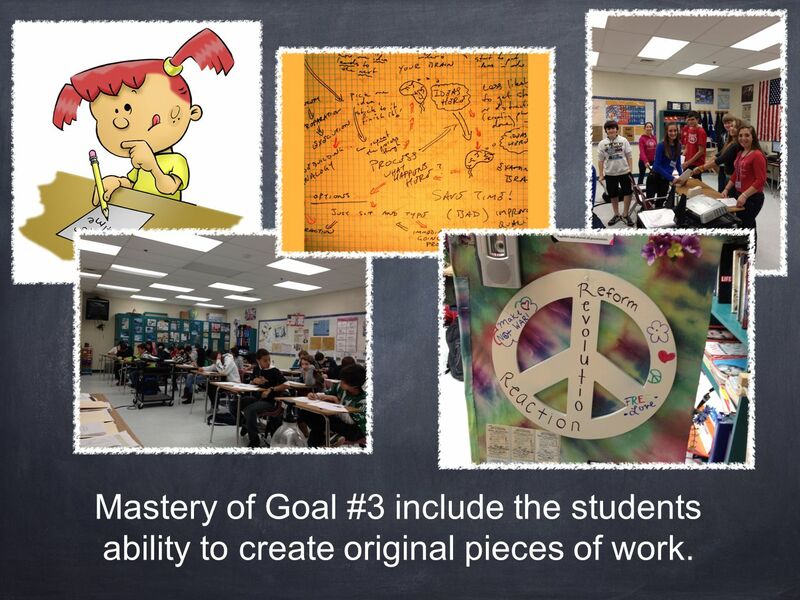 11 Mastery of Goal #3 include the students ability to create original pieces of work. Download ppt "" Knowledge will forever govern ignorance: and a people who mean to be their own Governours, must arm themselves with the power which knowledge gives."" US History Data Team Process Pete Bothun Paul Madson Rob Schultz Emily Walz Pete Bothun Paul Madson Rob Schultz Emily Walz. 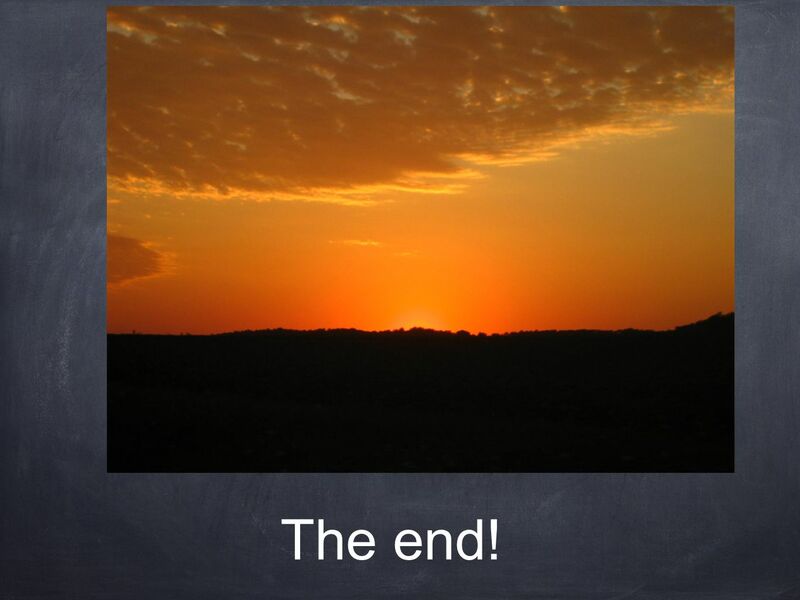 FOCUS 2 An Online Career,Major & Education Planning System Career Planning Readiness Self Assessment Major and Career Exploration Action Planning, Decision. Homeroom Absence Request Forms Absence Request Forms Picking up on Plaza Picking up on Plaza. Honoring our Heritage: Exploring Issues of Discrimination 1. FOOTPRINTS OF FREEDOM Elementary UCI History ProjectFall 2012. Graduate Expectations. Critical Thinking & Life Management. IBT graduates are expected to: identify and demonstrate the essential employability skills. 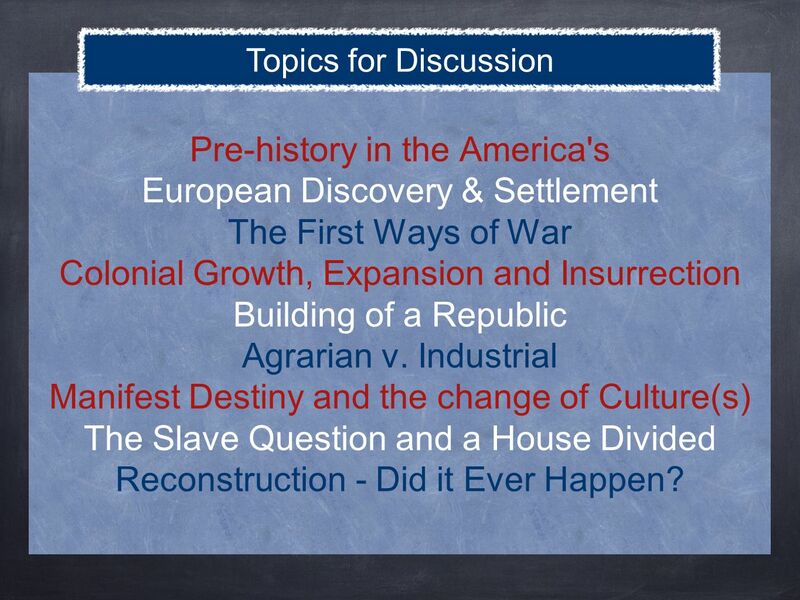 American History 1 Are you ready for:. Goals for Today:  Are you ready for change?  What is different about AM1 from US?  How is AM1 laid out?  How. The Original 13 In the hands of the natives.. 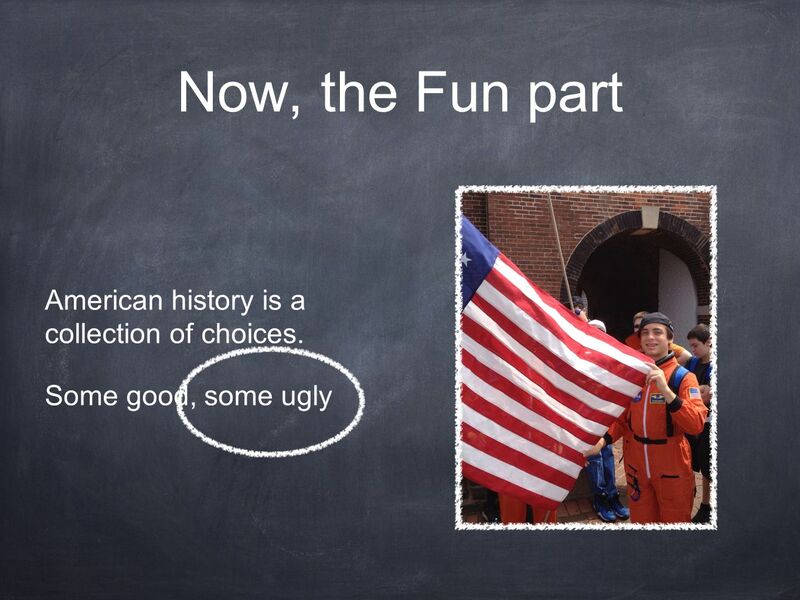 The Big Question If the settlement of the 13 Original Colonies was done by the Native Americans instead. 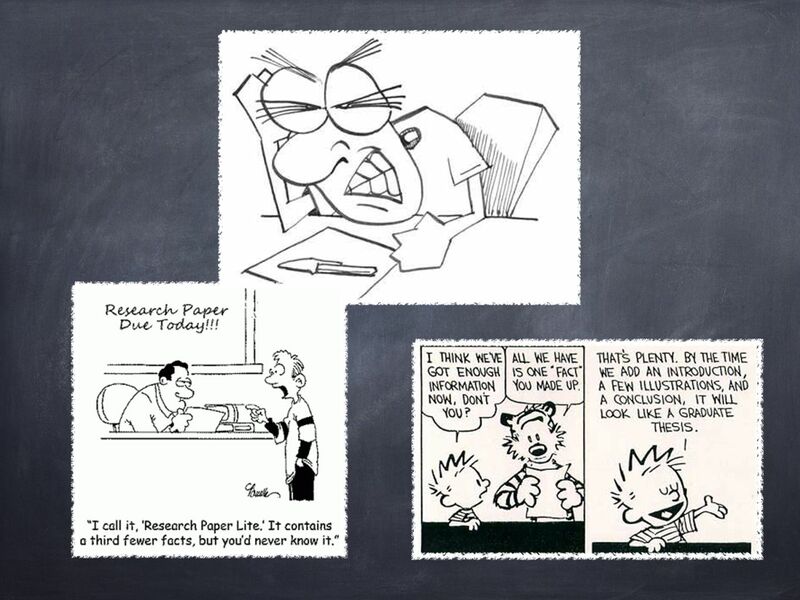 21 st Century Social Studies 9 th Grade Orientation Steven Maher, Social Studies Supervisor …not your parent’s Social Studies. 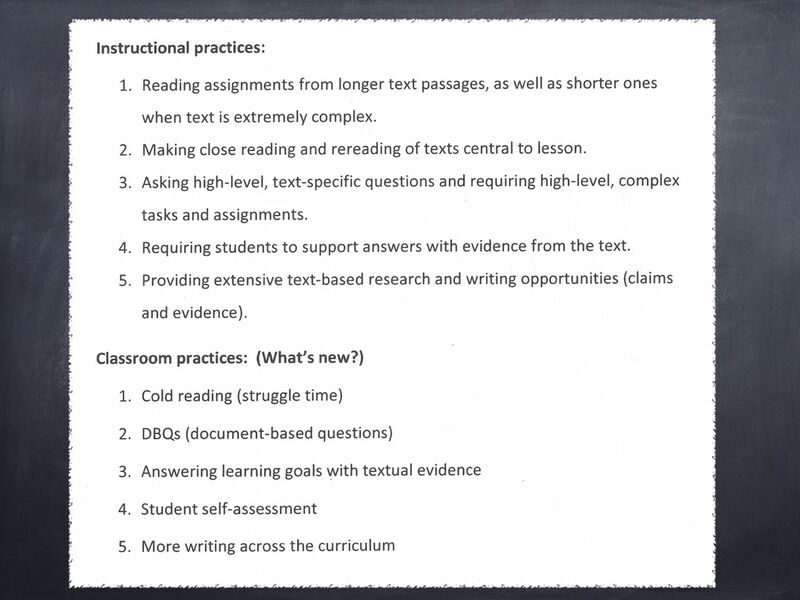 Action Research: “Combating Racist Attitudes in High School Classrooms” Amy Everhart Secondary: English, Political Science. 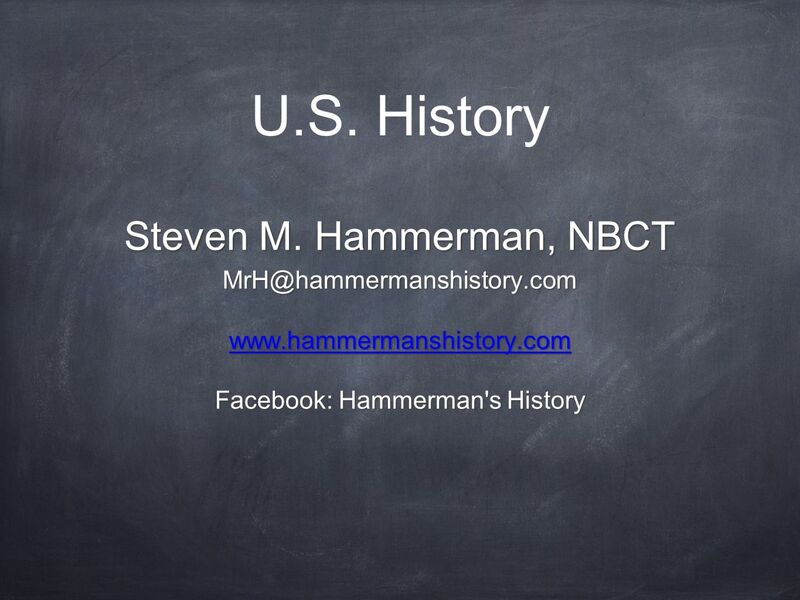 Mr. Hendricks SS Period 2, 4, 6 8-13-2013 STUDYING HISTORY The study of the past We build on what others did in the past. 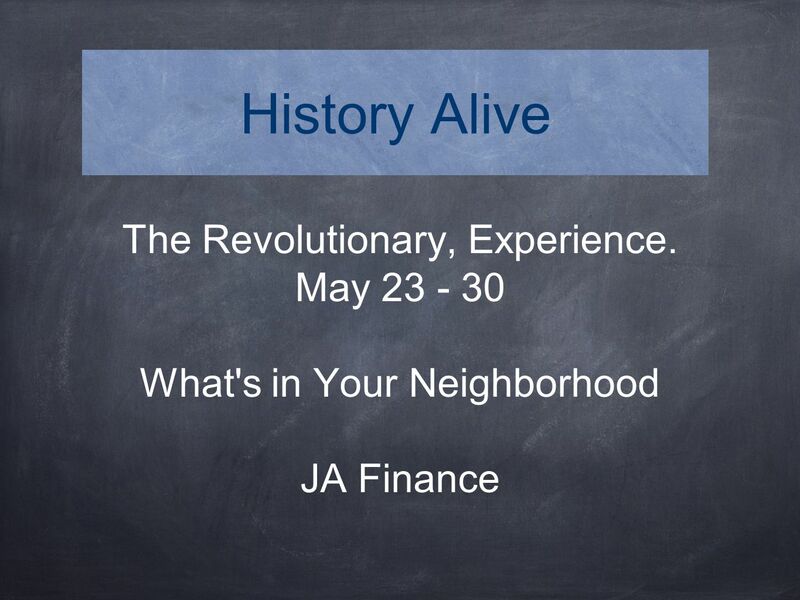 History is the study of the past.